As mentioned in my first post I imported English and Scottish league results from Football-data and ran some basic rating systems against the data. 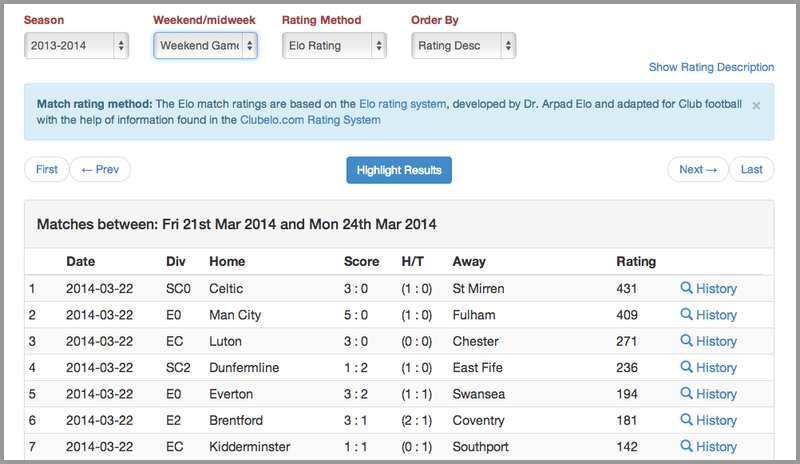 You can view match ratings for past results and fixtures as well as recent form for the teams prior to each game. The rating methods I’ve used are based on articles found online and are not meant as any kind of sophisticated method for picking winners or making a profit in the long term. I ran these on UK football results from 2000-2001 up to the current season just as an interest and they are only a starting point for any analysis. The screen shot belows shows how you can select and navigate through past results back to season 2000-2001. I’ve looked at three match rating methods including an Elo rating system, goals superiority and a basic Win = 3, Draw = 1, Loss = 0 points method. However, no reference is made to true odds, value, goal expectancy or Poisson distribution etc. These are related topics with plenty of in-depth discussions online that I still hope to read and fully understand. The basic rating takes the last 6 league results for each team (home or away) and totals the number of points gained: Win = 3 points, Draw = 1 point, Loss = 0 points. The match rating is the home team’s points minus the away team’s points . The next rating method is based on the goal superiority rating system mentioned in Football-Data’s FREE PDF guide to Rating Systems for Match Prediction. This one also looks at the last 6 league games. In this method a team’s ratings is calculated as their total goals scored minus their total goals conceded. The match rating is then the Home team’s rating minus the away team’s rating. Football data’s article goes on to describe how to calculate a home win – draw – away win probability distribution and true odds for the three outcomes. The Elo rating method is a bit more involved and you can read more background information here: Elo Rating System. I’ll go into a little more detail on how I use the Elo method in my next post but at the moment I feel it is a bit more accurate than the other two methods for predicting match outcomes. The example results table below highlights last weekend’s Elo match ratings where the top 11 games all went to form as home wins. However, most weeks this is unlikely to happen as some games won’t go to form. So I finally get round to starting this blog. Why am I doing this? Well there is the fun element of having a bet on football (and a picking winner) but also I’m revisiting my interest in analysing football data. This is something I enjoy and started to do in the mid 90s using soccer data-sets and before that it was helping my dad choose his v-plan 81 selections for the pools. However, I am not a statistician or betting expert but a software developer that hopes to learn more about betting on football in general, staking plans, value and finding an edge. What is Since a Win? The domain is a reference to the football sequence tables and recent form runs that appeared in newspapers prior to upcoming football fixtures. These tables would list football teams in descending order of how long since a particular result i.e. since a win, since a draw etc. At the moment I am importing English and Scottish league results from Football Data for analysis and as a starter have created some simple rating methods based on articles found online. 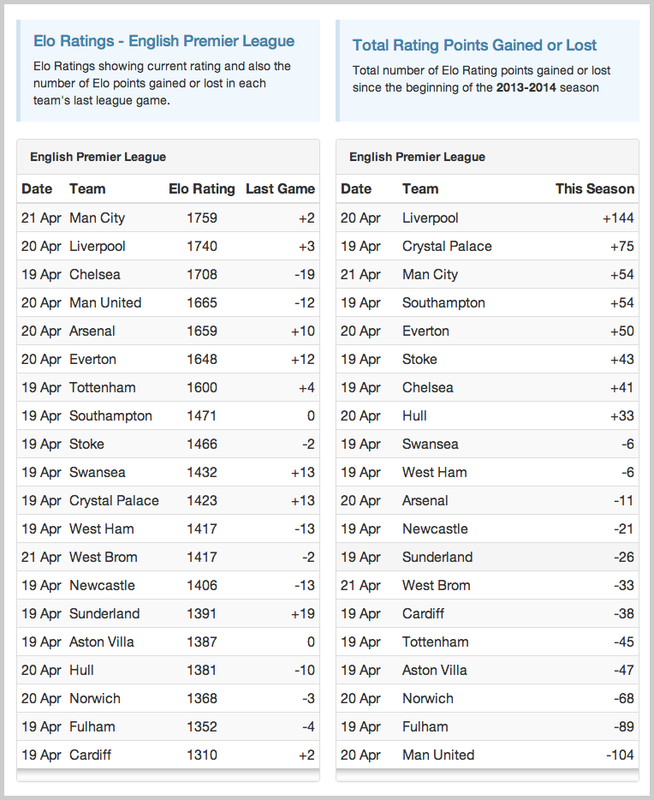 Football-data.co.uk has been around a while and is an excellent resource for footy data if your into analysing and creating your own football betting systems. Originally I used to pay a tenner to access the data files but they have been free to download since 2007. Most of the time I shall be coding or analysing rather than writing but when I find something of interest I’ll share it.